"... a game changer on a universal scale … should be required reading." Available as an eBook at Smashwords, Amazon, Barnes and Noble, Sony, Kobo, Apple, Blio, Diesel and other fine eBook retailers. 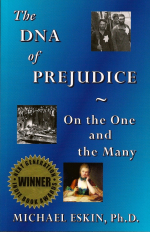 This remarkable book takes the reader through the many layers of meaning that accompany the word 'prejudice'. By critically confronting the ways in which we think and speak about prejudice, Michael Eskin clears the path for a new understanding of prejudice as a concept, a phenomenon, and a lived experience. Combining analytical rigor with sound practical suggestions, this book speaks to a broad audience and will serve as a valuable companion for anyone who shares the author's passionate commitment to confronting and eradicating prejudice. "Sedulously argued, this thoughtful book attempts nothing less than a revalorization of prejudice - its meaning, the way it manifests itself, and its effect on individuals (the prejudiced and those who feel the sting of it) as well as the world around them. It's an ambitious undertaking, deftly navigated by Michael Eskin, who cogently offers an entirely original framework for identifying prejudice and even confronting it. In an environment that has been optimistically (if naively) called post-racial - in which racial, gender, and ethnic divides appear to have as much poignant resolve as ever - Eskin's important book offers a set of powerful pathways for comprehending and addressing a pernicious aspect of life that remains far too at home in the headlines, the rural backroads, and the chill of urban streets." "An original, much needed (and overdue) philosophical work with important practical and political implications, not only for our own societies, but also for those who work cross-culturally, like diplomats. We encounter the issues Michael Eskin discusses in one form or another often - it seems like every day." "This remarkable book takes the reader through the many layers of meaning that accompany the word 'prejudice'. By critically confronting the ways in which we think and speak about prejudice, Michael Eskin clears the path for a new understanding of prejudice as a concept, a phenomenon, and a lived experience. Combining analytical rigor with sound practical suggestions, this book speaks to a broad audience and will serve as a valuable companion for anyone who shares the author's passionate commitment to confronting and eradicating prejudice." Dr. Licia Carlson, Harvard University, author of The Faces of Intellectual Disability: Philosophical Reflections"
"A crystal-clear and elegantly written book on prejudice … Eskin’s razor-sharp and precise definition of prejudice is entirely convincing, and it is a true pleasure to read this book." "The DNA of Prejudice is a wonderful essay that excels both at analyzing the essence of prejudice and at providing a demonstration of the practice of philosophical thinking accessible to all with no requirement or knowledge of the history of philosophy. 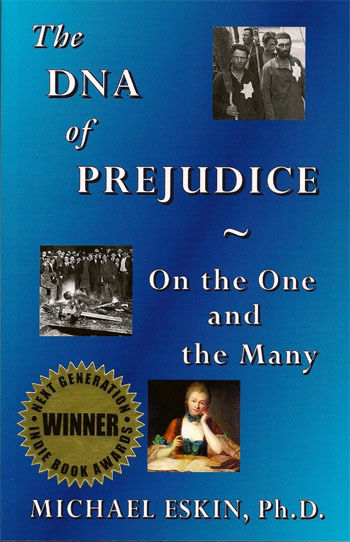 Highly recommended for all who have an interest in the topic of prejudice and/or philosophical thinking." Michael Eskin, Ph.D., was educated in Israel, Germany, France, Minnesota, and New Jersey, and is the cofounder and Vice President of Upper West Side Philosophers, Inc. – Studio & Publishing, as well as the Vice President of SCALG, the Society for Contemporary American Literature in German. A former Fellow of Sidney Sussex College, Cambridge, he has also taught at the University of Cambridge and at Columbia University. His many publications on cultural, philosophical, and literary subjects include: Nabokovs Version von Puskins “Evgenij Onegin”: Zwischen Version und Fiktion – eine übersetzungs- und fiktionstheoretische Untersuchung (1994); Ethics and Dialogue in the Works of Levinas, Bakhtin, Mandel’shtam, and Celan (2000); On Literature and Ethics: A Special Edition of Poetics Today (2004); Poetic Affairs: Celan, Grünbein, Brodsky (2008); 17 Vorurteile, die wir Deutschen gegen Amerika und die Amerikaner haben und die so nicht ganz stimmen können (under the pseudonym ‘Misha Waiman’; 2008); Philosophical Fragments of a Contemporary Life (under the pseudonym ‘Julien David’; 2008); The DNA of Prejudice: On the One and the Many (2010); The Bars of Atlantis: Selected Essays by Durs Grünbein (as editor; 2010); Yoga for the Mind: A New Ethic for Thinking and Being & Meridians of Thought (with Kathrin Stengel; 2013). He has been a frequent guest on radio programs and lectures regularly on cultural, philosophical, and literary subjects across the US and Europe – most recently, as a guest of the United States Department of State and the United States Consulate General Germany, The Federation of German-American Clubs, and Limmud, an international organization fostering cross-cultural Jewish education.